At the very core of having any relationship with music is some sort of bodily response. Something about the way a jumble of instrumentation and words makes the listener feel. Motivating you to dance, to bliss out, to concentrate, to connect, to feel part of something beyond, and more meaningful than just a sound coming out of a speaker. Another fundamental aspect of listening is the relationship you have, inadvertently, with a piece of music over time. Certainly, music can become a personal anthem or some weird location in your life. Dropping the needle on the record or hitting play on your preferred device, zones in the same fixed piece of music. What you are doing as the music pans out is of course completely variable. Stretched out on your favourite chair, drunk on the night train, running through the park, cooking breakfast, catching up on emails, masking the tunes on the high street or zoning out of the window… Maybe you ended up elsewhere whilst the music played out to an empty room. It’s clearly a very basic point I’m making but the same fixed music event is impacted by how actual real life unfolds around us. It’s also worth noting that music under the banner of experimental can be shark infested. There are numerous works that can feel like achievements to actually make it through. Works that sit in that conceptual bubble of existing on your shelf. But the avant garde doesn’t need to a toxic place. 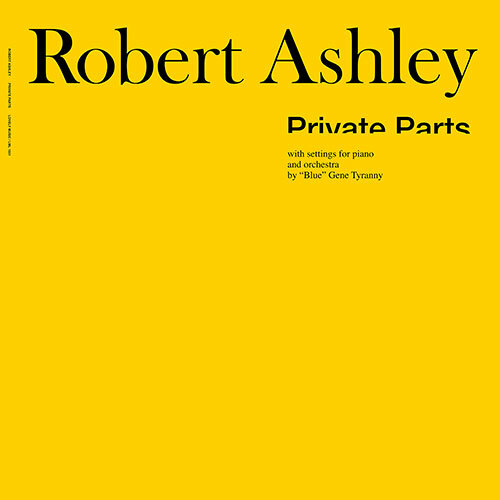 Perhaps in all this chin stroking, one of the best, most welcoming and yet – fundamentally oddest records I’ve heard is Robert Ashley’s Private Parts. It’s an album that seems to exist like another reality immediately next to our one. An album I’ve owned for years but due to its imminent re-issue I figured I’d attempt the daunting task of actually trying to make sense of it. Private Parts was originally released on the aptly named Lovely Records in 1978 and features two side long pieces The Park and The Backyard. Both feature Ashley’s long form monologue with various keyboard/synth and tabla accompaniments throughout played by Blue Gene Tyranny and Kris. Private Parts later became the first and last parts to Ashley’s famous opera, Perfect Lives. The ambition is vast and impossible, The Park – detailing the internal workings of the male brain and The Backyard – the female. A stream of interconnected thoughts and random floating daydreams and phenomena with new age spacey synth and gently exotic tabla. Although the components stack up like some later day hip Ken Nordine poem, the results are bizarrely unique. Within the first few seconds, Ashley has sucked you into his world of audio velcro. Words, phrases, sounds and ideas all gently sucking you into a bizarre hyper-dimensional trip into his mind. What he’s saying, and his long American drawl, oddly meshing with the music’s grid, is somehow comfortingly mundane. It’s a movie with no car chases or explosions. It’s a film where the camera lingers on the door handle or the washing fluttering on the clothes line. A framed weirdness of oddly normal American everydayness. – Ashley intones 9 minutes into The Park that is one of a million arbitrary moments that oddly describes the whole thing. An endless stream of words gently threaded with each moment. Private Parts as a physical object includes the ‘lyrics’ printed on the inner sleeve. The sleeve itself is typographically straightforward except for the slightly clipped lower quarter of the album title. Private Parts is quite simply a unique sonic event, a hugely mad celebration of the depth of human experience. An organic mirror. Evidence of the immeasurable layered mental engagement which we all experience every moment. Perhaps the ultimate acknowledgement is the first thing anyone who comes across the album notices in the bold yellow of the sleeve. To me, the heighten sense this album bathes your brain in, from the first instance, seems to be nothing less than a celebration of the fundamental reason for life in the first place – the sun. The invitation is simple – live with Private Parts a while – it’s one of the best albums ever.